Hyper-complex production meets cognitive computing. Electronics manufacturing is surrounded by continuous complexity. Executives face rising resource costs in traditionally low-cost production markets. They must address increasing customization, shorter lead times, frequently changing requirements and shrinking order sizes – all while managing a sophisticated supply network. They need to examine automation potential and maintain critical institutional knowledge. Thinner margins and increased competition threaten consistent quality, risk greater downtime and reduce desired flexibility. Investments in new equipment and automation systems are increasing the amount of data available from the shop floor, but most is not used to its full potential. 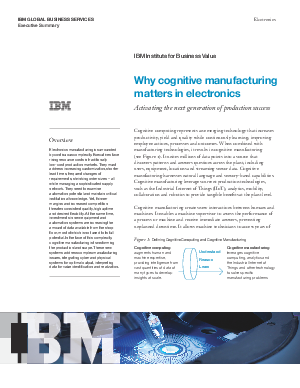 Now, cognitive manufacturing is transforming production to address such complexity. These new systems address manufacturing issues, integrating cyber and physical systems for optimal output and interpreting data for value identification and realization.